Clapton parted ways with the Robert Stigwood Organization and his next studio album would be released on the Warner Brothers label. RSO responded with the innovative concept of issuing a greatest hits package and a compilation of live material to provide a well-rounded view of the artist. Unfortunately both this album as well as the TIMEPIECES greatest hits package suffer from lack of a thematic approach. Haphazard song selection coupled with no discernible unifying concept render this collection non-essential. Save your money. There are better live albums out there. Record label (RSO) product. Nothing more. No theme, no chronological progression, merely cheaply packaged random live tracks. Any artist, especially Clapton, deserves better treatment than this. At least other record companies were decent enough to wait until Hendrix was gone prior to releasing shoddy packages of this nature. 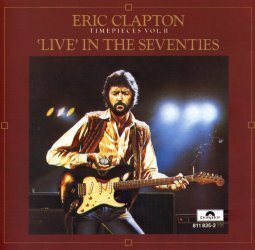 I think that this album is good but definitely not the best live Eric Clapton CD on the market. It's hard to get into the music of this CD because the music is kind of raw. The best track is probably "Can't Find My Way Home", this is a good live version of this song. Overall I would give this album 5 out of 10 stars because I think that there are better live albums out there. Also, I think that the song selection of this CD could be a little better.